You’re sitting in 47K, the ever-flushing toilet behind you, squeezed between a hippo and a woman who has both a freakishly small bladder and the window seat. The airline's playing Cloudy with a Chance of Meatballs 2. 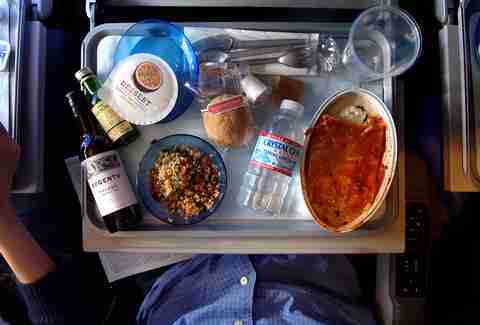 When things can't get any worse, a beige "meal" is dropped onto your tray table by a sneering flight attendant. But where does plane food come from... before making it to the galley? Take a Pepto, gentle reader, and follow its journey from menu ideation to meal, learning some quirky facts about flying food along the way. 1. 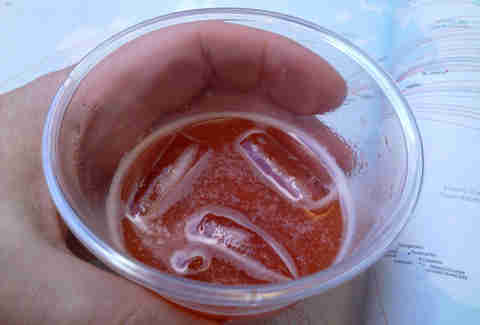 Meals are meticulously planned up to a year in advance, right down to how many maraschino cherry portions go in each fruit cocktail (answer: one). That’s because every ingredient counts -- American Airlines saved $40,000/yr by removing a single olive from each of their in-flight salads. 2. 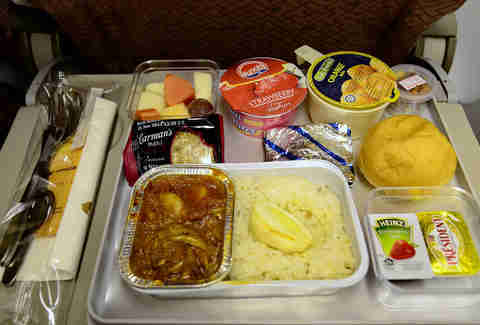 Often, food's tested in-flight, because cabin pressure affects your palate. The lack of humidity dries your nose, and as a plane takes off the change in pressure numbs one-third of your taste buds. So your Chilis-to-Go Spicy Buffalo Wings, which would’ve lit a fire in the terminal, will taste bland at altitude. Even the sound of the engines affects how you perceive taste -- loud/ constant noise further deadens your tongue. 3. Safety standards and space constraints mean your food’s made on the ground, near the airport. Big boys like LSG Sky Chefs produce 15,000 bread rolls every hour (24hrs a day, 365 days/yr), and 30,000 sandwiches a day. 4. As a rule of thumb, food is prepared 10hrs before it gets eaten. Those “Made Fresh!” stickers are there to mock you. It’s not ready-to-eat by any means at this stage; generally, chicken is cooked 60% of the way, and steak 30% to done, with the final phase occurring onboard. Once cooked, it gets blast-chilled in special fridges -- in a not-quite-frozen-but-not-edible state, your food awaits transfer to the tarmac. 5. Meals then wait in their own kind of flight-specific gate lounge -- only theirs is refrigerated. 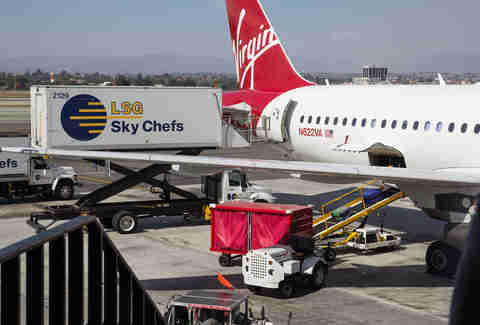 If a flight’s delayed, and food has already been loaded onto the plane, airlines often dump the entire load and order a replacement shipment from catering. Costly and wasteful? Sure, but consider the alternative -- on V-day in 1992, an Aerolineas Argentinas flight from Buenos Aires to LA poisoned its passengers with cholera-infested shrimp; 76 people got sick and one guy died. 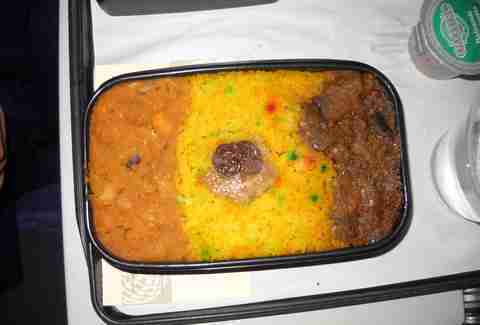 If a delay’s announced early enough, the food’s preparation is held off or, if finished, it’ll be frozen. 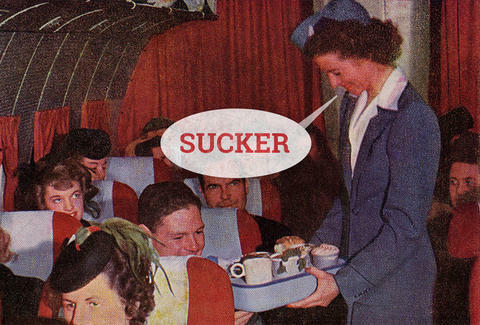 Fun fact: many airlines insist their pilot and co-pilot eat different meals to minimize the risk of them both getting sick, and having to rely on Ted Striker to land the plane. 6. Flight on time? Food on the plane? Time to finish the prep-work. Contrary to what most people think, planes generally don’t have microwaves. Your little tray makes its way into a convection oven for about 20min. Convection ovens have a fan (which pushes hot air onto the food) that's both faster and means a lower cooking temp. 8. What’s your safest bet? If it’s a hot meal, the stew or curry’s probably the failsafe option, as it’s pretty consistent no matter how under- or over-heated it is by the time it makes its way back to 47K. Skip chicken and pasta dishes, where proteins go to die and starches break down (read: noodles get soggy, and chicken dries out). Despite stringent food safety regulations, those aren’t urban legends you hear every year or so about danger lurking beneath the foil. Passengers on Air Canada and Delta found needles in their sandwiches; a Qantas passenger found maggots in her trail-mix; someone on a Jet Airways flight found a dead lizard in his biryani; a couple flying first class on American Airlines bit into shards of glass in their ice cream; and a 7yr-old on Air India picked a cockroach out of his kids meal. Maybe go ahead and grab that Chilis-to-Go after all. Sophie-Claire Hoeller is the associate travel editor for Thrillist Travel. Her favorite airplane food is an Ambien sandwich with red wine. Follow her @Sohostyle.